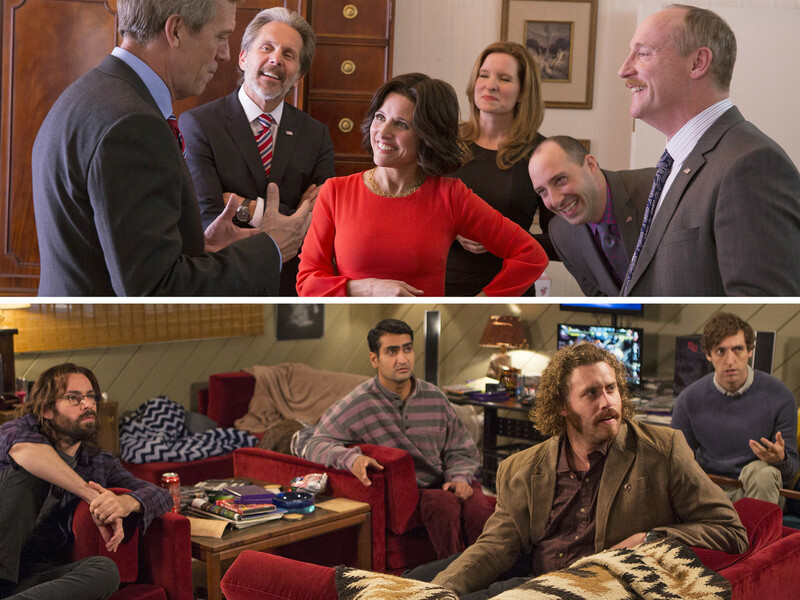 From American Crime to Veep, our resident critic chose the cream of the TV crop for this year. Here are the series that stood out in 2015 and made his annual top 10 list. Could they pull it off a second time? (Unlike, say, True Detective.) You betcha! FX’s impeccably cast­—often against type—perfectly paced and insanely entertaining tragicomic thriller follows warring Midwest factions in 1979, led by the brilliant Jean Smart as the boss of a doomed Fargo crime family, and the bumbling not-so-innocents caught in their violent wake, including a remarkable Kirsten Dunst and Jesse Plemons. The show uses retro devices like split screens and freeze frames to heighten tension and magnify the juxtaposition between quirky whimsy and white-knuckle suspense. The shocks never stop coming, leading to a legendary massacre in Sioux Falls upstaged by a close encounter with a Coen Brothers–inspired UFO motif. Fargo truly is out of this world. The first chance I get to binge-rewatch any show from 2015, it will be Sam Esmail’s trippy, wondrously strange auteurist masterpiece of cyber intrigue and socioeconomic revolution. Confusion can be intoxicating when delivered with this much nervy style. As socially maladroit hacker Elliot, a morphine-addicted David taking on the Goliath of an Evil Corp, the mesmerizing Rami Malek takes us down a hallucinatory rabbit hole, and this USA Network breakthrough feels like the love child of Lewis Carroll and William Gibson. Setting off the sort of pop-culture fireworks many thought network TV had lost the knack to deliver, Lee Daniels’s hip-hop Dynasty roared into life as Fox’s biggest and juiciest hit in years, reflecting a vibrant African-American musical landscape just waiting to cross over into the mainstream. In an age of extreme TV, this sensationally produced melodrama takes a more-is-more approach with its recklessly overstuffed plotting and fabulously diverse, over-the-top characters. Long may they sing—and scheme. I’m cheating a bit here, as I can’t choose between these two glorious HBO satires. Airing back-to-back on Sundays this past spring, they made up TV’s finest single hour of comedy. Silicon Valley upped the ante in its rhapsody of geek anxiety in its second season, with the tech world clamoring to get a piece of Pied Piper while its founder (the hilarious Thomas Middleditch) floundered amid the dizzying horse trading. And the current political-campaign circus has nothing on the riotous Emmy darling Veep, with fumbler-in-chief president by default Selina Meyer (Julia Louis-Dreyfus) desperately running to hold on to her seat, whatever the personal cost to those most loyal to her. Possibly the most timely, troubling and unsparing drama of the year, John Ridley’s powerfully acted “limited series” for ABC (emulating cable in its serious ambitions) unfolds against a broad urban canvas of racial disharmony, class animosity and familial dysfunction in the wake of a brutal murder. With outstanding work from a cast unafraid to present themselves in an unflattering light­—including Felicity Huffman, Timothy Hutton, Elvis Nolasco and Emmy winner Regina King (all of whom are returning for Season 2 in new roles)—this was not an easy show to watch. Or forget. Providing the year’s most resonant cliffhanger—seriously, Jon Snow?—which left even book readers in the lurch (because that’s exactly where the most recent volume left off), HBO’s dark fantasy for the first time actually began to improve on its source material, though not without controversy. (RIP, Shireen. We’ll never forgive Stannis for that fiery call.) Streamlining and tightening the sprawling epic’s dramatic focus in adapting the fourth and fifth novels in George R.R. Martin’s A Song of Ice and Fire saga, Thrones maintains its magnificent ability to conjure devastating set pieces, not all involving dragons. Who’d have believed we’d feel for a fiend like Cersei (Lena Headey), whose naked walk of shame through King’s Landing was a series high point? Now that the show has caught up to the books, has anticipation ever been higher? What a year for this fearless comic actress: a hit movie (Trainwreck), a killer HBO stand-up special and perhaps the most boldly assured season yet of her triumphant Comedy Central showcase, deservedly taking home the first-ever Emmy in the Variety Sketch category. Schumer resists categorization as she wittily sends up stereotypes of gender and body image—never with more panache and punch than in the inspired “12 Angry Men Inside Amy Schumer” parody episode, which imagined an all-male jury debating her attractiveness. The verdict: Amy 1, chauvinism zero. In one of the most marvelously meta collisions ever, TV audiences last summer could tune in to the stupefying The Bachelorette on Mondays and then immediately shift gears by watching how that brand of voyeuristic sausage gets made in Lifetime’s thrillingly savage fictional exposé of the “reality” behind reality TV. Humanity is left on the cutting-room floor as a jaded producer (the winsome Shiri Appleby) sells her soul by reluctantly doing the bidding of a demonic boss (Constance Zimmer, electrifying in her bawdy cynicism), turning a made-for-TV fairy tale into a nightmare. No one emerges unscathed in this guiltiest of pleasures, especially the reality-TV fan. A nation’s collective mourning over the end of Breaking Bad was assuaged by the arrival of Vince Gilligan and Peter Gould’s unconventionally gripping and darkly comic prequel. We’ve never seen a spinoff quite like AMC’s Better Call Saul, mostly because this affecting origin story shows us a different side of shyster Saul Goodman—who way back in 2002 was still a sad-sack bottom-feeder known as Jimmy McGill, not on anyone’s speed dial. Bob Odenkirk invests this stranger with a raw desperation and endearing integrity, which we know won’t last forever. The emotional stakes intensify every year in FX’s masterfully relentless but underappreciated spy thriller. The third season finally forces the secret Soviets next door, Elizabeth and Philip Jennings (expertly played by uncanny chameleons Keri Russell and Matthew Rhys), to reveal to their all-American daughter, Paige (Holly Taylor), the truth about their deadly identities and mission. So many twists, layers and collateral damage are woven into this tapestry of lies, as the consequences of the espionage trade weigh ever more heavily on the couple. The biggest mystery about The Americans: Why can’t the show and its stars get on Emmy’s radar?